myReviewer.com - Review - Holy Franchise, Batman! The release of The Dark Knight Rises, the end of Christopher Nolan’s rebooted franchise has garnered a lot of interest and the inevitable tranche of merchandise. Most will be directly related to Christian Bale’s incarnation of Batman but this new book is slightly different. 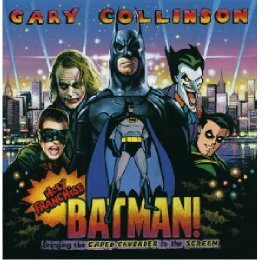 The author, a NE lecturer and writer called Gary Collinson, is a real Batman geek and, in fairness, you’d have to be to in order to pull off a book like this. This is a history of the Caped Crusader but a rather different one. This is the history of the Caped Crusader on the screen, both TV and Cinema. With the obligatory opening section on the origin story with plenty of comic references, it moves swiftly onto its raision d’etre. It’s both surprising, and yet not, that Batman was first co-opted by the US war effort to defeat agents of the Third Reich on the cinema screen in 1943 before the first proper attempt to bring the Caped Crusader to film in a proper comic book setting some six years later. Sadly, it went down like a lead balloon and wasn’t seen again until Adam West donned the cape. And then again...until Tim Burton came along. The book is set into sections within sections. Films are dealt with separately and series within each season. This gives the book a uniformity and allows you to quickly skip over bits you don’t find that interesting or to avoid spoilers (as each episode/film has a plot summary). There’s an awful lot of research gone into this book and it’s quite an interesting read overall – I just wasn’t interested in the latter part of the book regarding the animated seasons of Batman, but was pleased that Collinson included crossover appearances in the original series of Scooby Doo. One of the most interesting things I learnt was that the on-screen ‘Kapow’ captions from Adam West’s first season were relegated to caption cards in order to cut costs for the second series. Such a simple move but not one I’ve ever noticed before. This book is clearly aimed at those with a working knowledge of the Caped Crusader and a need to know about every appearance film (video or celluloid), which means the potential audience is going to be limited. It is a well written book that is well put together, and worth the price for those who are have the required geekiness to use this as a reference book, as I suspect it was intended.